If you’re in need of an EASY chocolate-y dessert recipe, this one is simple and ultra delicious. If you don’t want to get your hands dirty, grab the kids to help make these Best Ever No-Bake Pumpkin Bites! Let them do the rolling and pick their favorite toppings! I am making these BEST EVER No-Bake Pumpkin Brownie Bites for a tailgate party this weekend and they are SO delicious I had to share with you all. Plus, it’s Fall, so they obviously have pumpkin in them! As a Dietitian, people always think I avoid desserts and eat kale all day. That is certainly not the case. I have a busy life, I eat and enjoy desserts and yes I eat kale too! With that said, I also need to make things simplified in the kitchen most days! This is when pre-made brownie mix comes in handy for dessert recipes like this. You might think when you are mixing everything together you are doing something wrong. But keep mixing! The pumpkin will incorporate with a little more stirring. If you want to add another Tbsp. of pumpkin puree to get it to the right texture due so. Be careful of adding too much pumpkin puree. There is also no need to bake this brownie recipe. 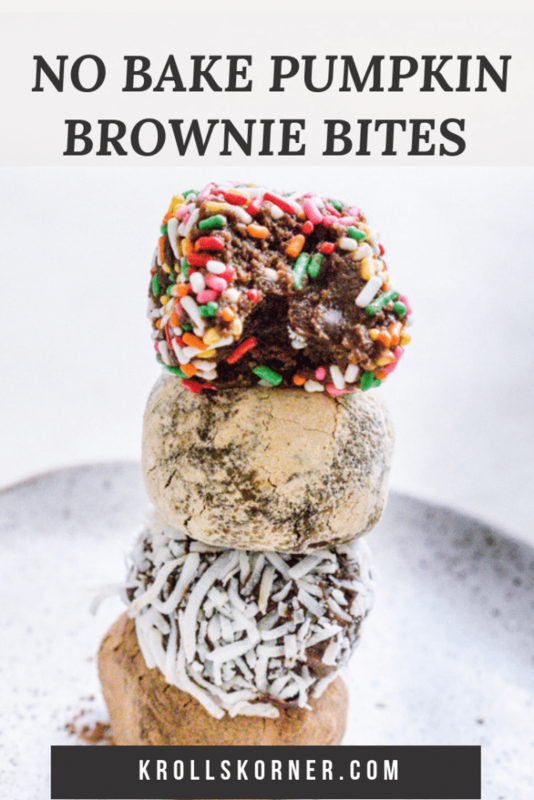 That’s be magic of these brownie bites. Add the chocolate chips, almond flour/meal, pumpkin pie spice and stir. No fuss with a food processor or an oven! If you want to use less pumpkin puree – you can add a Tbsp. of coconut oil and start incorporating that it. It may need to be melted in a microwave safe bowl before you stir in. Another delicious version I’ve made with these bites is to add peanut butter or almond butter instead of the pumpkin. This adds a totally delicious flavor, healthy fats a little boost of protein. 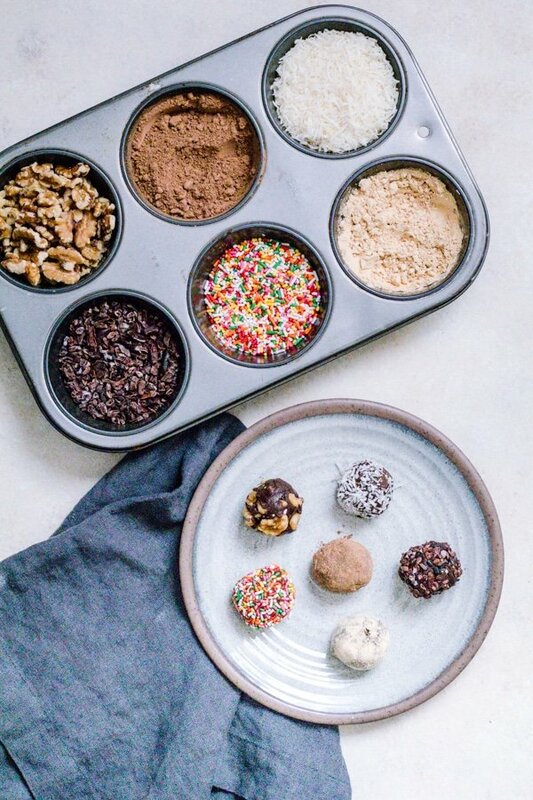 I like to keep these no bake brownie bites in the fridge for 15 minutes before I roll them into 1 Tbsp. size balls. This helps mold the shape of the batter. Once your batter is ready to roll, you’ll want to spray PAM on your hands so the batter doesn’t stick. It’s fun to make these in advance – and then when you are ready to decorate get your toppings ready to go in muffins tins or you can use cupcake tins are well. Both are easy and fun to roll in! If you feel like this is too much of a cheater recipe – you can always make your brownie mix from scratch! You do you boo boo! PIN THESE NO BAKE PUMPKIN BROWNIE BITES FOR LATER! The BEST chocolate-y dessert recipe you'll want to make ASAP. No-Bake Pumpkin Brownie Bites made with 5 simple ingredients and are a treat everyone will love! 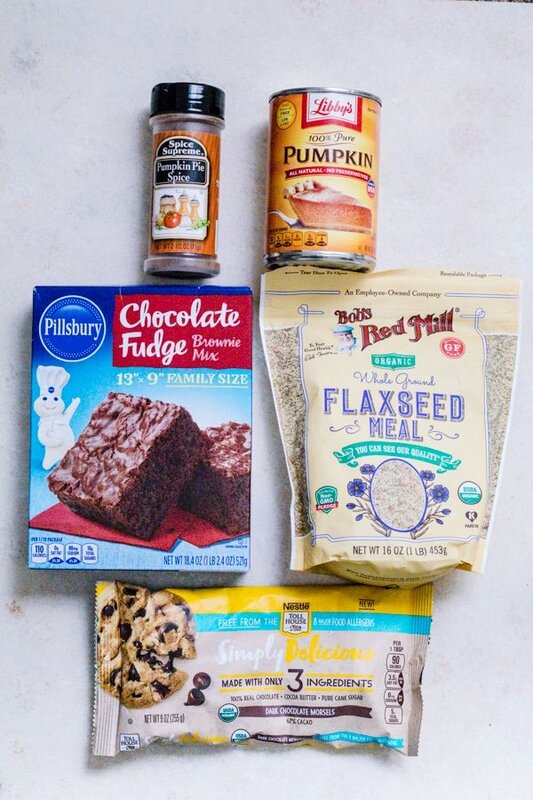 In a medium sized bowl, mix together the brownie mix, canned pumpkin, flax, chocolate chips and pumpkin pie spice. The mixture will eventually start to incorporate, give it a chance! Continue to stir until you notice it starting to mix. If not, add 1 Tbsp. more pumpkin and mix again. Refrigerate batter for 15 minutes so it firms up. Then, spray PAM on your hands so the batter won't stick to your hands. 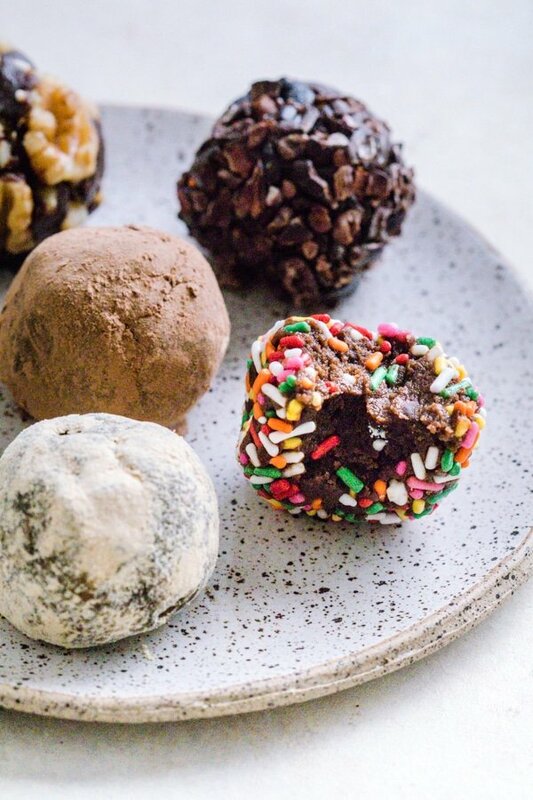 Roll the no bake bites into 1 Tbsp. sized balls (or about that size). Then roll into your favorite toppings and enjoy! If enjoying later, store in a sealed or airtight container! Some of my other favorite chocolate recipes on the blog include these Gluten-Free No Bake Date Brownies. They are made using Medjool dates and all ingredients are mixed in the food processor! I store these brownies in the freezer and enjoy for a pre or post workout pick me up! Speaking of fudgy brownies – my Black Bean Avocado Brownies are a fan favorite. The avocado adds a creamy texture and you can fool anyone with this recipe – they will never know there are black beans in it! 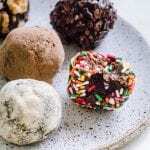 These no bake brownie bites are a little similar to my chocolate lovers peanut butter bites – if you love this recipe and are a fan of peanut butter – this recipe will be another winner in your house! Keep them in the freezer and pop one out for a snack or dessert! What do you think of this recipe?! OMG I can’t wait to hear what they think! Have fun making them! These look so delicious! I may need to add this to my weekly meal prep. Let me know what you think! Thank you Amy! 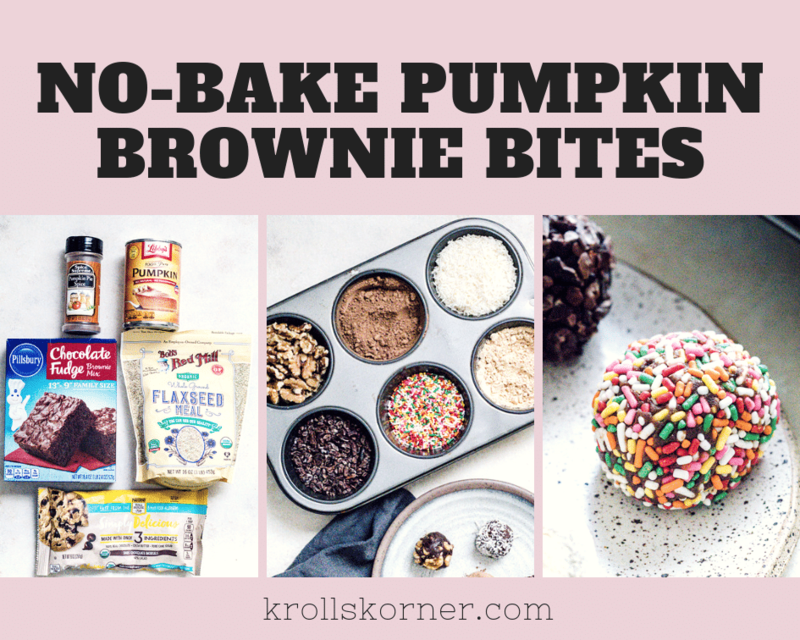 My 3 favorite things – no bake/ brownies/ and pumpkin – love this! These look so rich and chocolate-y and delicious! The stuff of DREAMS. Kara thank you soo much! These look yummy and those toppings look so fun. All the sprinkles for me please! I am straight up drooling! Pinned these so I can try them this weekend. I’m going to be doing some extra prepping and these are perfect. I’ve been craving all things pumpkin! These look SO yummy! I just bought gluten free brownie mix, and have all the other ingredients. I just might have to make them this afternoon! The fact that I dont have to bake these makes me so happy, they turned out so good and were so easy to make! Pumpkin and brownie together is the perfect combo! I can’t believe how simple and delicious these are! So fun for kids too! Thank you for trying! Mmm quick option for when you’ve got a sweet tooth. They are so easy to whip up! Thank you! These were sooooooo simple! I have a no bake version as well but it requires the food processor so this one is wayyyy more ideal! Thanks! You had me at easy and chocolate-y! so good, the perfect afternoon treat!